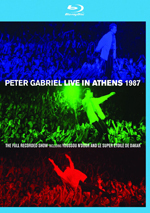 Peter Gabriel: Growing Up Live presents the complete 2003 Milan concert from Peter Gabriel's tour based around the album "Up". If you watch the DVD for City of Angels, you’ll find an interview with Peter Gabriel as he discusses his contribution to that flick’s soundtrack. We also hear from others as they relate their appreciation that Pete took time out from the recording of his own upcoming album so he could offer something to Angels. Boy, that effort must have really drained him, for Pete’s next album – entitled Up - wouldn’t hit the shelves until about four and a half years after the theatrical release of Angels! No, I don’t actually blame Angels for the delay, as Pete obviously had been at work on Up for quite some time prior to the film. In fact, “I Grieve”, his contribution to Angels, appears on Up, albeit in a different version. I don’t know why it took Pete 10 years between albums. Us came out in the fall of 1992, and even that seemed like an eternity since its predecessor, 1986’s smash hit So. Allegedly Pete had so much material left over from Up that another album – perhaps entitled Follow-Up - was intended to come out soon. 14 years later, fans still wait for Gabriel’s next release. At least Up led Pete to hit the road for the first time in eight years, as the “Growing Up” tour launched in the fall of 2002. It began as a simple theater performance – I think designed for Pete to get his feet wet after so long – and soon became an elaborate indoor arena show staged in the round. “Growing Up” spent most of its time that way, but when Pete came back to the US for a second leg in the summer of 2003, he scaled down the concert for outdoor amphitheaters. Many of the same components remained, but these lacked the same level of ambition. On Growing Up Live, we find one of the large arena shows. Shot over two nights in May 2003 at the Filoforum in Milan during May 2003, Growing Up ably documents the show before it hit the amphitheaters. Not surprisingly, the concert focuses most heavily on songs from Up. Six of its 17 tunes come from that album: “Darkness”, “Sky Blue”, “The Barry Williams Show”, “Growing Up”, “More Than This” and “Signal to Noise”. The remaining 11 tracks come from a mix of sources. Not released in the US, the millennium project Ovo produces “Downside Up” and “Father, Son”, while “Animal Nation” comes from an unlikely source: the soundtrack of The Wild Thornberrys Movie. Us offers “Secret World” and “Digging In the Dirt”, while I>So provides “Red Rain”, “Mercy Street”, “Sledgehammer” and “In Your Eyes”. Finally, “Here Comes the Flood” and “Solsbury Hill” both emanate from 1977’s Peter Gabriel. Pete completely ignores material from his three albums released between 1978 and 1982, and that means the absence of famous songs like “Shock the Monkey”, “Games Without Frontiers” and “Biko”. Back in the Seventies with Genesis, Pete made his name as an elaborate showman, and Growing Up continues that trend. Performed in the round, the visual aspects of the concert focus on the center of the stage, a location from which objects lower. For example, during “Growing Up”, a “hamster ball” comes down; Pete enters it and rolls it around the stage. The perimeter of the stage also comes into play. During “Downside Up”, Pete hooks himself to a device that allows him to walk around the edge while upside down. For “Solsbury Hill”, Pete stays on the ground, but he rides a bike around the outside of the stage. Most of the songs stay with more subdued visual elements, though. Pete offers enough theatrics to spice up the show, but he doesn’t rely on them to an extreme. Part of me wishes he’d done more of that sort of visual material, but another part feels satisfied that he didn’t go nuts with gimmicks. In any case, Growing Up documents a good but not great show, and one issue relates to the imbalanced setlist. Actually, that was a concern with the 1993-94 Secret World tour, as it included precious few songs recorded prior to So. At least Growing Up adds “Here Comes the Flood” to old stalwart “Solsbury”. Still, it would’ve been nice to hear Pete broaden his repertoire. I’m happy to get a substantial amount of new material, but I’d prefer less So. I know it’s his biggest album, but it still doesn’t need to feature quite so prominently. Pete got into pre-1986 material like “Shock the Monkey” and “Games Without Frontiers” during the 2003 amphitheater shows, and it’d be good to see him expand to some less well-known numbers as well. Despite those minor gripes, the setlist of Growing Up seems fairly well balanced. As was the case with Secret World Live, Pete probably leans too heavily on slow numbers, though. The show doesn’t sag in the middle ala Secret World, which really started to drag at one point. However, it also doesn’t enjoy as many highs as Secret World. It’s more consistent but less dynamic. Parts of the same band accompany Pete here, as we find long-time Gabriel partners guitarist David Rhodes and bassist Tony Levin. I believe none of the others played with Pete in the past, though one’s known him her whole life: his daughter Melanie, who offers backing vocals. I wouldn’t call this the best band to support Pete, but they seem more than up to the material and render the songs well. Pete literally looks like a different man in 2003 compared to 1993. With more to his waistline and less to his hairline, you’d be very hard-pressed to recognize him. Though this might startle folks, I must admit it’s nice to see a rock star who doesn’t obsess over his appearance and who accepts his aging. Pete could have gone the hair plug route but obviously didn’t think it mattered, and it doesn’t. Pete seems a little less active on stage compared to the old days, and I don’t think we’ll see him crowd surf like he did back in the Eighties. Nonetheless, his command of the stage remains. Some performers simply look like they’re in control of things, and Pete displays that attitude. This means that even when he stands still, he makes things interesting; he can communicate more with a glare or a hand gesture than other performers relate in entire shows. For the most part, Growing Up goes with a simple and fairly effective visual presentation. Director Hamish Hamilton depicts events concisely and without too much quick cutting or gimmicks. Some exceptions occur, though, such as the occasional use of split-screen. This mostly happens between songs and allows us to see the action onstage as well as behind the scenes material. This occasionally becomes a minor distraction, but not to a substantial degree. Otherwise, Hamilton keeps goofiness to a minimum. Songs like “The Barry Williams Show” go for unusual tactics such as artificial TV interference. I could live without that, but it does suit the lyrics, so I won’t complain too much. Overall, Growing Up offers good documentation of a good concert. Neither side of the equation seems outstanding, as I’ve seen better live shows and better performance Blu-rays. Nonetheless, this one maintains a high standard of quality across the board and presents a satisfying piece. Growing Up Live appears in an aspect ratio of approximately 1.78:1 on this Blu-ray Disc. Up presented very attractive visuals. Sharpness mostly seemed solid. Occasionally, wide shots came across as a little soft and ill defined. However, those examples appeared infrequently and did little to distract from the rest of the presentation, which usually looked concise and detailed. I noticed no issues with jagged edges or moiré effects, and I also detected no signs of edge enhancement. Source flaws looked absent, and I saw no issues related to artifacting, noise, or other distractions. I will note that some quality drops appeared at times. Various forms of interference appeared during “The Barry Williams Show”, but this was intentional, so I didn’t consider this to be a flaw. Some songs featured lower quality cameras for a few shots as well; for example, as Pete cycled around the stage, a camera viewed him from the handlebars, and it also resulted in less than stellar images. I didn’t think it was fair to lower my grade due to these factors, though, as they became inevitable. Since Pete and band dressed totally in black, the majority of the colors came from lighting. Those hues looked well developed and accurate. Even the thickest lighting remained distinctive and rich. Blacks were deep and dense, while low-light shots came across as clear and appropriately visible. Growing Up delivered a solid visual presentation. The DTS-HD MA 5.1 soundfield seemed smooth and well rendered. Vocals stayed centered as the music swirled around Pete. Instruments spread cleanly across the front and seemed appropriately placed. It was easy to isolate each one, as they seemed nicely delineated. Surround usage mostly leaned toward crowd noise and general reinforcement of the music, though it seemed a little more active in that regard than most concert programs. The mix occasionally went gimmicky, such as during “The Barry Williams Show”, which panned electronic noises in the rear at one point. “Growing Up” also used the rear speakers pretty actively for vocals, synthesizer, and even some guitar. For the most part, though, the surrounds accurately and solidly supported the front but didn’t cause distractions. Not only did the track present a well-defined soundfield, but also it offered stellar audio quality. Vocals consistently sounded warm and natural. Happily, the producers resisted the urge to give the singing a thin reverberation to simulate the arena experience, so the vocals seemed distinctive and detailed. All instruments came across as accurate and concise. Drums punched crisply, while guitars chimed nicely. This became a consistently satisfying auditory presentation. How did the Blu-ray compare to the original 2003 DVD? Audio seemed warmer and fuller, while visuals displayed improved clarity and bite. The Blu-ray bettered the DVD across the board. Growing Up comes with a bunch of supplements, and first we get The Story of Growing Up, a nine-minute, 40-second documentary. It presents images from the show while Peter Gabriel discusses the themes on display. Gabriel gets into the overall visual design for the stage and chats about various elements like the upside-down bit and riding the bicycle. Pete also lets us know a little about the band members. “Story” is too short to give us much depth, but it’s a nice little synopsis. Next we find Tony Levin’s Tour Photographs. This five-minute montage presents the bassist’s candid photos accompanied by an alternate version of “More Than This”. The package touts it as a remix, but it’s really a totally different take of the song, not just a mild reworking. That audio piece makes this area particularly valuable. Next comes a documentary entitled Still Growing Up Unwrapped. Directed by Pete’s daughter Anna, this one-hour, 16-minute, 49-second program shows live snippets, the band on the road, and comments. We hear from Pete, his band, and some fans. Pete dominates, though, as he chats about playing live, making music, his life, and his experiences. “Unwrapped” could have turned into a nice glimpse of all those topics. Unfortunately, it’s just a glorified concert video. It does little more than package the “Still Growing Up” show – seen on a separate disc in this set - with occasional soundbites. We learn a few good notes such as how Pete’s time opening for Frank Zappa affected him, but since we already have “Still Growing Up” on its own, this piece feels redundant most of the time. We also get some additional songs. Filmed before the start of the 2002 tour, we find studio performances of “Darkness” (six minutes, 20 seconds), “No Way Out” (7:29) and “Growing Up” (7:23). All are interesting to see given the simple surroundings. “Out” is particularly useful since it doesn’t appear live anywhere else. We also see BBC performances from Later… With Jools Holland in May 2000. These include “Downside Up” (6:14) and “Father/Son” (4:15). “Up” is intriguing in that Pete takes a backseat and doesn’t do the lead vocals. Instead, Paul Buchanan handles his part, while Elizabeth Frazer does the female vocals done by Melanie live. Both tunes come from the Ovo project, and I believe those two reprise their roles from it. “Father/Son” goes back to Pete on vocals. Both are cool additions to the disc. Disc One ends with Growing Up on Tour – A Family Portrait. This runs 39 minutes, three seconds and provides comments from Peter Gabriel, engineer Richard C, bassist Tony Levin, keyboardist Richard Evans, drummer Ged Lynch, guitarist David Rhodes, vocalist Rachel Z, and keyboardist/vocalist Melanie Gabriel. Created by Anna Gabriel, “Portrait” offers great access to Gabriel and band, but the show never becomes especially revealing. Shots from rehearsals and behind the scenes offer value, but even those lose points because Anna Gabriel uses off-putting visual gimmicks that degrade the image and make the program borderline unwatchable. Though there’s some good content here, the overall product feels unsatisfying. A second disc offers a DVD with Still Growing Up Live. Originally available as an individual release, it goes for one hour, 27 minutes, four seconds and offers performances shot during the 2004 leg of the Up tour. If you click on this link, you can read my full review of the original Still Growing Up release. This disc literally duplicates that one – its second platter of extras got rolled into this set’s Blu-ray. To summarize, Still Growing Up doesn’t work as well as Growing Up, but it’s a worthy companion piece. I expect most Gabriel fans already own it, though, and the fact it remains a DVD and not a Blu-ray disappoints. I don’t know why Still Growing Up didn’t get its own Blu-ray presentation. Also on this DVD, we find two Bonus Tracks. These include a 2004 performance of “In Your Eyes” and a 1987 take on “No Self Control”. I’m not clear why “Eyes” wasn’t part of the main program since it appears to come from the same set of shows that created Still Growing Up. In any case, the 11-minute, 45-second tune offers a good performance and makes a nice addition to the set. As for “No Self Control”, it stands as a more logical “extra” given that it doesn’t connect to the 2004 tour at all. It combines live shots with images of the band on the road. I’d prefer more of the former than the latter, but it’s still a decent blast from Pete’s past. The package concludes with two booklets. 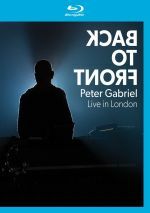 The “Growing Up Live” one offers photos and credits, while the “Still Growing Up” booklet features pictures, credits and an intro from Peter Gabriel. 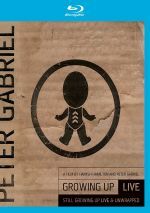 Despite a long break from live performance, in 2002-03 Peter Gabriel demonstrated he could still put on good shows, and Growing Up communicates that tour nicely. The show doesn’t excel at much, but it seems consistently well above average and entertaining. The Blu-ray offers excellent sound and picture along with a quality batch of bonus materials. Growing Up becomes a nice release for Gabriel fans.